A princess was kidnapped by a villainous entity and must be rescued by a daring young hero. It is a simple concept that has been told thousands times through the millennia and has pervaded many cultures. It is the simple premise of Sakura Samurai: Art of the Sword, an action adventure game on the Nintendo 3DS eShop. Set in medieval Japan, Sakura Samurai tells the tale of Princess Cherry Blossom, a divine entity beloved by all in the Land of the Rising Sun. One day, however, the princess is kidnapped by an evil being, who seals her away in a hollowed-out gourd. Years later, a young samurai meets a kappa near a spring. The kappa blesses the warrior’s sword, and tasks him with saving Princess Cherry Blossom from the evil that has imprisoned her. This deed will be easier said than done, as Sakura Samurai uses a unique combat system that may take some getting used to. 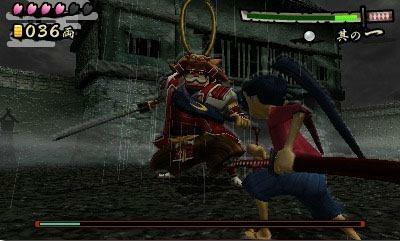 Unlike some action adventure games, the combat in Sakura Samurai takes on a more defensive sort of gameplay. Simply running into combat while mashing the attack button will not end well. Players will have to wait for their opponent to move before striking. It is similar to the tougher fights in The Legend of Zelda: Ocarina of Time with enemies like the Stalfos and Lizalfos. Instead of blocking attacks with a shield, though, players have to dodge the attack and strike as their opponent’s defenses are open. The concept may seem simple enough, but once the game tosses in enemies that attack multiple times at once, enemies that attack from a distance, and enemies with longer reach, the combat becomes quite challenging. This reminds of an episode of “Deadliest Warrior”. Aside from the combat, Sakura Samurai has quite a bit of content for a downloadable game. There are towns to visit, resources to manage, and minigames to partake in. Unfortunately, there is little difference between these towns. Each have the same shops, same denizens, and same challenges only with a different layout. A harder difficulty can be unlocked once the game is beaten as well as multi-man challenges. It is nowhere near the level complexity found in a fully-fleshed retail title, but Sakura Samurai offers a pleasantly robust experience compared to other downloadable games. Sakura Samurai‘s aesthetic, like the story, is sweetly simple. The colors are vibrant and characters are designed with a cartoon style, creating a world that is filled with personality and life. The showers of cherry blossoms that recur throughout the game bear special mentioning, as they look especially impressive in 3D. Sakura Samurai: Art of the Sword is a very meaty game for the eShop. There is quite a lot for players to sink their teeth into. At its core is a simple, yet engaging, combat system that challenges players to wait instead of charging thoughtlessly towards an enemy and button mashing. With its low price, there is little reason for players not to give this little eShop gem a try.